What is Las Vegas Roulette? Games of roulette deal with a wheel with numbered slots and two extra slots of 00 and 0. A ball spins around this wheel while the wheel turns, and once it loses speed, the ball will drop and fall into a numbered slot. Roulette slots in Las Vegas have the numbers 1 all the way to 36, which alternate between black and red colors. Two slots that are green have the numbers 00 and 0 on them. 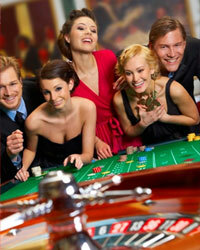 Several casinos also provide the European version of roulette, which only has one 0 that goes with the regular numbers. Roulette games in Las Vegas have one goal: to guess the number that the ball is going to drop into. You put your bets onto the table, depending on the place that you think its ball could land on. The house edge lies at 5.26% whenever the ball falls onto 00 or 0. In such cases, other bets will lose automatically. Each player can have various inside bets; they simply have to choose a number that the ball might fall into or various numbers depending on their overall positions. Players are also allowed to make outside bets that have different positional pocket groupings and pocket colors. The odds of payout for every kind of bet depends on its overall probability. Casino tables in Las Vegas usually have maximum and minimum bets, as well as rules that apply individually for every player's bet for every spin. To find out the maximum and minimum betting limits of your table, talk to your dealer. Players are allowed to keep betting until an official announcement is made to stop.